investor is bearish on the markets. We have already seen Alpha and Beta Indices provided by National Stock Exchange of India and now NSE India has introduced few more indices like Nifty TR 1x Inverse Index and Nifty TR 2x Inverse Index. 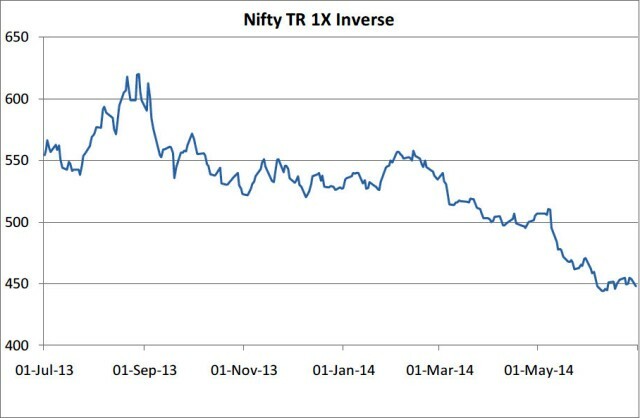 Nifty TR Inverse Index provides the investor an opportunity to create an position which gives inverse (opposite) returns as compare to Nifty TR Index. The index is designed to provide the inverse performance of the Nifty TR, representing a short position in the index. Nifty TR 1x Inverse Index Value = Previous day’s Nifty TR 1x Inverse Index Value * (1+ Nifty TR 1x Inverse Index Return). Similar to Nifty TR 1x Inverse Index, there is one more index namely Nifty TR 2x Inverse Index, which is a Leveraged index is designed to generate multiple time return of the underlying index in situations where the investor borrows funds to generate index exposure beyond his/her cash position. Hope we can expect Inverse mutual funds soon from Indian Mutual Fund Industry and these indices could act as benchmark to the schemes. The returns are 17.96% which reflects the returns given by the nifty index. Active funds are regularly managed/reviewed by experts ,And hence they charge fees to the extent of 5 t0 10%..Whereas in passive funds like ETF are not monitored by them.But they buy the units as per their predefined waitage of differen shares.They are not bothered whether that particular scrip doing well or nt.That if they have decide to buy 5%tcs ,they keep on buy 5% amount of your unit for tcs.Hope this helps. From where I can have comprehenssive list of scrips listed in niftybees and kotakbees with their percentage waitage. ?